I was listening to The Diane Rehm Show on my commute to go teach my classes this morning. Diane’s guests were Isabel Sawhill of the Brookings Institue, Nina Marks of Collegiate Directions Inc, and Robert Lerman, professor of economics at American University. I wasn’t surprised that the answer to the question, “Should everyone go to college?” seemed to be a qualified no. I have been a community college professor for more than a decade. Please don’t misunderstand. I believe anyone who wants an education should pursue one. But I also see many incredibly gifted students who have skills that they are actively discouraged from mastering because they are supposed to have a Bachelor’s degree. I see young people who have no real interest or desire to stay in school another four years who are miserable and many who are racking up debt when they could be doing something they enjoy, avoiding debt, and making money. The reasons many students embark on a college career is that society expects them to do so. High schools now are heavily invested in Advanced Placement classes; this push to be “college ready” actually begins in middle school, where Pre-AP classes are not the exception, but the rule. Gone, for the most part, are offerings that used to be alternatives in high school electives, like shop classes. One of Diane’s guests remarked that kids go to college because they have no idea what else to do. They know simply having a high school diploma is not enough so they enroll in community colleges or universities, with no clear idea why or what they truly want to do with their lives. Of course, not being sure about one’s career path in their late teens or early 20s is not unusual, but some students never settle on a true choice and a fair percentage drop out by their junior year. Now they have little to show for their efforts (“some college” doesn’t say much to a potential employer) and most have debt to boot. Ironically, trades in this country, like welders, mechanics, and plumbers, are sorely lacking skilled people yet we continue to insist that everyone go to college. Well, because most kids haven’t taken statistics yet, they are blinded by that number at the end. 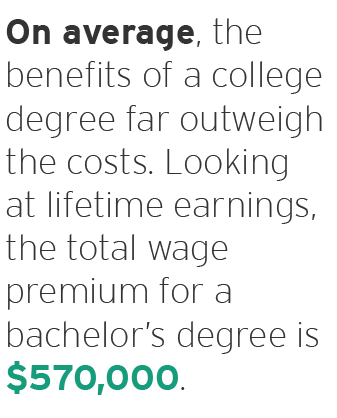 But what they miss is that key, determining word… “AVERAGE.” Many of us, (and I have far more than a BA), earn FAR LESS. Three factors, studies show, greatly affect on what end of that average you will be: school selectivity, college major, and graduation rate. 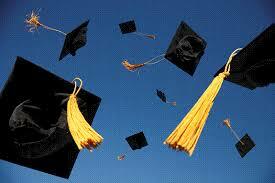 If you do decide to go to college, considering what to major in ought to be a part of your process. For me, I love literature and writing and I wholeheartedly pursued advanced degrees in those fields. But now… well, I do not regret for a minute what I learned BUT I do wish I had pursued something with higher earnings potential that would allow me more free time to indulge my passion rather than being dependent on it. Ya feel me? So take a look at this, The Cold Hard Facts. I had never really thought about how society pushes toward attending college until I taught at a CTE-focused school. Our students came from 2 high schools and we experience students who were told they shouldn’t take a CTE class because they were too smart for that, or girls who liked automotive and were told that females don’t do that…wouldn’t they rather take Early Childhood Development? Where did they hear this drivel? Their guidance counselors. Under the impression that CTE students must either be Special Ed or disinterested in school, they constantly steered these students with AP potential away from carpentry, welding, machining, and ag classes.